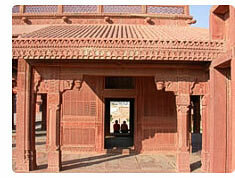 37 kms from Agra is built a city predominantly in Red Sandstone and is called Fatehpur Sikri. 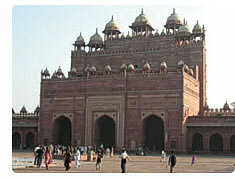 This town was built by the Mughal Emperor, Akbar. He had planned this city as his capital but shortage of water compelled him to abandon the city. After this within 20 years, the capital of Mughals was shifted to Lahore. To the right is an apparently looking two storeyed building, with corner kiosks, known as diwan-khana-I-khaas or Hall Of Private Audience. On entering it, one finds only a single vaulted chamber. In the centre stands a profusely carved column supporting a collosal-bracketed capital. Four narrow causeways project from the centre and run to each corner of the chamber. It is believed that Akbar�s throne occupied the circular space over the capital and the corners were assigned to the four ministers. The journey to the royal palace begins with Diwan-I-Am or the Hall Of Public Audience. This hall was also used for celebrations and public prayers. It has cloisters on three sides of a rectangular courtyard. To the west is a pavilion with the Emperor�s throne. Beautiful jali screen on either sides separated the ladies attending the court. To the left of the Diwan-I-Khaas is the Treasury or Ankh Michauli, once believed to have been used for playing the game, comprising three rooms each protected by a narrow corridor which were manned by guards. To the left of the Pachisi Board is the Turkish Sultana�s house. The house, as its location at the corner of Anup Talao shows, was a pavilion for repose, attached to the pool. The geometrical pattern on the ceiling is reminiscent of Central Asian carvings in wood. To the left of the Sunehra Makaan is the largest and the most important building in the royal palace, named after Akbar�s Rajput wife, Jodha Bai. This spacious palace was assured of privacy and security by high walls and a 9 metre guarded gate to the east. 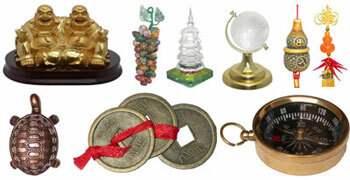 The architecture is a blend of styles with Hindu columns and Muslim cupolas. Located in the corner to the left is the emperor�s private chamber. It has two main rooms on the ground floor. 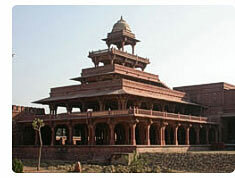 One housed Akbar�s library while the larger room was his resting area. On the first floor is the Khwabgah or the bed-chamber. It was connected with the Turkish Sultana�s house, the Panch Mahal, Mariam�s House and the Jodha Bai�s palace by corridors. Opposite to the Diwan-I-Khas is the palace of Akbar�s Rajput wife, Mariam-Uz-Zamani. This two-storeyed building is richly adorned by gold murals in Persian style. The beams have inscriptions of verses by Akbar�s brother, Faizi. To the right of Jodha Bai�s palace is Hawa Mahal, the Palace of Winds. This small-screened wind tower faces the garden and is attached to the palace. The garden is laid out in the Char Bagh style with straight walls intersecting at right angles and divided by shallow channels. To the north west of the Jodha Bai�s Palace is the 2 storeyed palace occupied by Akbar�s two senior queens- ruqnayya begum and salima sultan begum. It has two storeys-four rooms and two porches with pyramidical roofs below and two rooms with cupolas and screened terraces above. The building combines hindu and muslim atyles of srchitecture. 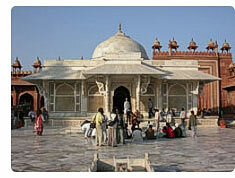 One of the largest mosques in India, Jami Masjid was built in 1571 AD. Inside, there is a vast congregational coutyard. To the right, at the corner, is the Jammat Khana Hall and next ot this is the tomb of the royal ladies. 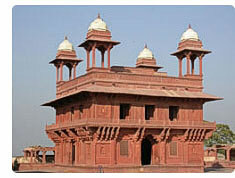 To the left of the Jami Masjid is the Stone Cutters� mosque, the oldest place of worship at Fateh Pur Sikri. It is entered through the eastern entrance known as the Buland Darwaza. To the North of the Mosque is the Dargah of Shaikh Salim Chishti. This Dargah was built in 1570. Here, childless women come for blessings of the saint. 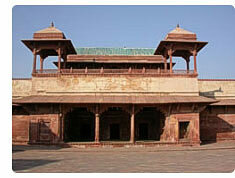 Even Akbar was blessed with three sons, when he came here. The lattice work in the Dargah is among the finest to be found any where in India. This gate can be approached from the outside by a 13-metre flight of steps which adds to its grandeur. The gate erected in 1602 AD to commemorate Akbar�s victory over Deccan is the highest and grandest gateway in India and ranks among the biggest in the world.